Made in U.S.A. 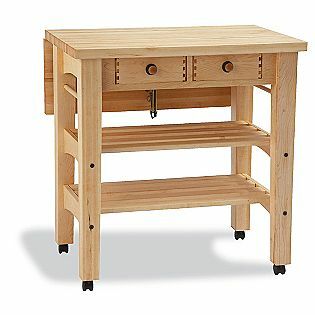 This Maple Kitchen Cart is made from the finest hardwoods and comes complete with 2 drawer and casters and a leaf extension. The cart combines great design and functionality with superb craftmanship. The size of the unit is extended by the dove tail corner and top center drawer guides. It simply everything a canner needs to be organized and to complete the canning job from start to finish. Dimensions: 34.5" L x 35.5" W x 36" H. Assembly required. Mfg. limited lifetime warranty.